Sacramento State Paramedic student Wil Stewart dashed to join his family, taking his front row seat at the University Union as an honored guest of Sacramento State President Robert S. Nelsen. Wil had just finished two local media interviews - one for CBS13 and the other for Fox40 - and promised another interview to KCRA, but he needed to take his seat with the President preparing to go onstage for his 2017 Fall Address. 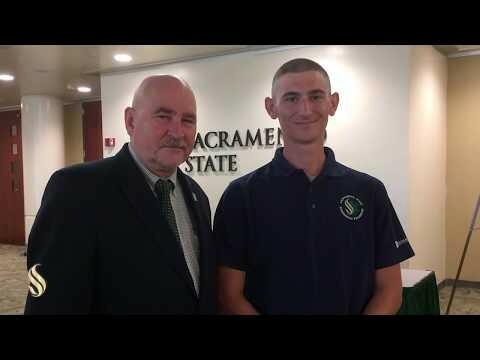 President Nelsen thanked Wil for saving a man’s life and for being “the perfect Sac State student.” His heroic deed made national news – and for someone who describes himself as naturally shy, Wil has done nearly a dozen media interviews. Sac State’s Paramedic Program deserves the spotlight, says Wil’s father Bill Stewart.